Home / Lifestyle / How To Add Fun To Your Mehendi Function? How To Add Fun To Your Mehendi Function? In Indian Weddings, Mehndi function has always been known for adding an extra dose of fun and colour. This pre wedding ceremony hold so much of importance and as the newest trends are taking over it has become of the most exciting function. Nowadays, mehendi functions are all about colourful décor, fun games and entertainment. 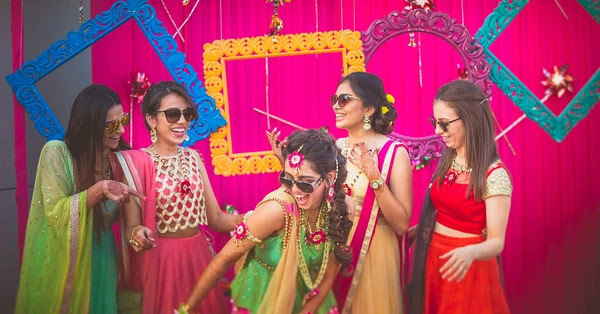 Girls usually look forward to this function as they get a chance to wear colourful attires and apply henna on their hands, which is the best part of the wedding to them. Here are some ideas that will surely help to add a splash of entertainment for your guests at your Mehndi function. Décor is the main essence of a mehendi function. Go for a theme of even add some quirk to your décor to make it attractive with bright colors. You can also go for personalized elements that can be added to the setting of your function. There are some wedding venues in Delhi that have unique spaces that can be decorated as per the requirement of the function. This is a very innovative way to engage your guests. Plus it will be really heart touching when your guests will give blessings to you and your family. You can make it fun byadding different stickers and coloured markers so that your guests canbe more creative. There is one more way to make it even more interesting… you canhang twines or strings with clips so that message slip can be clippedon that string. It will also add a unique and creative charm to the décor. This is very much unique and fun at the same time. You can let your guests go behind the bar and create their own cocktail concussions. This would be fun experimenting with different ingredients. You can also tell them to give names to their original mixes, to add a little dash of wit. At some corporate party venues in Delhi, the have introduced a high tech InstaPrint kind of machine that give out polaroid… You can even go for such kind of technology to offer a fun way to your guests make memories. We hope you liked these suggestions, if you got some more, then please share them in the comments below.